The number of Canadians purchasing smartphones may be rising, but an overwhelming number of Canadians continue to use their mobile devices for the most basic functions – texting and taking pictures, according to Delvinia Dig, a quarterly report on the digital behaviours and attitudes of Canadian consumers. In fact, according to Managing the Hype: The reality of mobile in Canada, the most mobile savvy group – NetGeneration (18-30), do not fully leverage mobile applications including Facebook mobile (22%), GPS/mapping services (21%) and Twitter (6%). Even Canadians with smartphone devices (Blackberry, iPhone and others) keep it simple when it comes to features and functionality. Marketers hoping to reach a wide audience with new mobile campaigns should take a closer look at their target audiences beforehand or they could be very disappointed, as a large number of Canadians don’t use more than basic functions like sending and receiving text messages and taking photos. 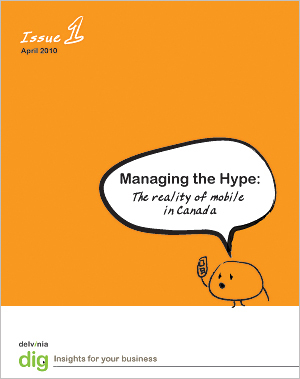 Delvinia’s 2009-2010 study of Canadian mobile behaviours conducted through AskingCanadians™ revealed a number of insights companies should consider before falling victim to the mobile hype. Some 38% of NGen don’t know or aren’t sure whether their smartphones are GPS-equipped. 41% of NGen and 52% of GenX have never used the GPS feature at all. 50% of those surveyed never downloaded a mobile application; even among the highest app users – Ngen and GenX – over 30% had never downloaded a mobile application. Among those that are downloading apps, Canadians prefer fun and relatively basic experiences as identified by their top application types – gaming (32%), social networking/instant messaging (22%), music (21%) and entertainment (21%). Well-used by all Canadians the mobile camera is a straight-forward, easy-to-use feature used often by consumers. Interestingly, while the majority of smartphone owners are taking pictures with their mobile devices, most are not using the more complicated functionality for sharing the pictures they take. A very small number of Canadians use MMS (18%), Facebook (15%) and Twitter (1%) to share mobile photos. 60% show their mobile pictures to others in person, while 30% don’t share the images at all. The majority of smartphone owners (70%) do not consider the camera on their mobile device as their primary camera. 65% NGen and 54% GenX play mobile games alone. Only 2% NGen and 1% of GenX play networked games with other users. Delvinia DIG is a quarterly report prepared by Delvinia Interactive based on data generated by AskingCanadians™ and its French counterpart Qu’en pensez vousMC a proprietary online consumer research panel. In October/November 2009 Delvinia conducted its annual re-profiling of AskingCanadian panellists and extracted a statistically representative subset of 5,680 responses (50/50 gender split, age and province breakdown per Stats Can) and discovered high mobile phone ownership in Canada, but relatively basic mobile phone feature use. A follow-up survey was conducted in January 2010 with 1,000 statistically representative AskingCanadians smartphone users to uncover further insights. To download the complete Delvinia Dig quarterly report on mobile or any previous insight reports visit www.delvinia.com/blog/books-reports/.